Thanks for the details of Loggie's memorials. He was one of the original members of the Special Companies when they were formed in in 1915. Thanks for filling in the gaps.I'm pretty sure that the report is accurate. Thank you very much for the information on Lt. Gale. It is very exciting to have you and other Forum members bring him to life for me. Very exciting! Your kindness in taking the time to help me with his information really is appreciated. Glad to have been able to help. I've done a bit more digging around and Henry Gale is also commemorated on a war memorial in St. Edward's Church, Roath, Cardiff. Strangely, although there are only 76 names on this, two others apparently served in the Special Brigade, one of whom also appears to have been in no. 1 Coy. Apart from CWGC and SDGW, do you have any information on these two men? Many thanks Gwyn. Or perhaps I should say diolch yn fawr. Just bought this on eBay. Private Eli Davis, 5th (Mortar) Battalion, Special Brigade. That's an interesting one Tom, thanks for posting. Looks like this chap was a driver of the ASC attached to 5 (Mortar) Battalion. I just recently discovered that a man whose Victory Medal I have was actually in the Special Brigade, R.E., and was killed in action in 1917. He was 206694 Pnr. Joseph PYNE and was in "C" company of the Special Brigade. Neither CWGC or SDGW show that he was previously 7089 Pvt. Joseph PYNE of the 1st Battalion, London Regiment before transferring, but his MIC does. Incidentally, his Victory Medal is inscribed with 1st Londons rather than R.E. Does anyone know what sort of work "C" company did? Also, none of these mention that he was most likely 19 years old, as a marriage index on Ancestry has him born "About 1896." They were a cylinder company dispensing gas, they also used the Liven's Projector to dispense gas and burning oil. Martin S Fox, a member of the company, produced two privately printed books on the company; one in the 1950's "With the Special Brigade, R.E. a brief story of 186 Company, R.E. and 'C' Special Company, R.E., 1915-1919" which has numerous photographs of officers and men, and another in the 1960's called "Corporals All , with the Special Brigade RE" a slightly different version of the above, without illustrations. A good detailed description of the Brigade's work can be found in Donald Richter's book "Chemical Soldiers". The company war diary from 1917 onwards can be found at the National Archives in London. Sorry Terry, new to this . My great uncle William Richard Dean was in the 4th special company of the royal engineers. He died on the 2/5/1917 and has a grave at Hazebrouck cemetery. His rank was a pioneer and his service number was183554. According to family beliefs he was killed by friendly gas. He was a chemistry student at Northampton polytechnic ( St john st London) prior to the war and I possess a prize in the form of a chemistry book presented to him by the polytechnic. I also know he enlisted in London but don't know when. Would like to find out anything about him. He is likely to have joined in very late 1915 the first quarter of 1916. He may well have been sent to the Whitehall recruiting office in London to enlist. This happened to a lot of men who had professional qualifications in chemistry, although I can't explain why. Without his service record , I can only make an educated guess at his further movements. It is likely that he would have gone to Chatham, and within a short period of time , to the Special Brigade, Home Depot at Plymouth, for posting to the BEF. 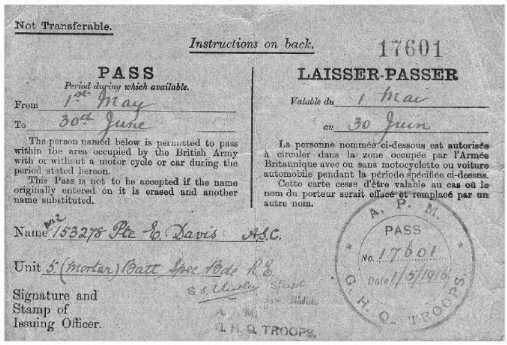 Having arrived in France he would have gone to the Special Brigade Depot at Helfaut, some 4 miles south of St Omer. Here he would have been inducted into the SB and received some technical training. The SB Depot HQ was in the Mairie and adjoining schoolhouse at Helfaut, both of which still stand but would have been billeted in one of the surrounding villages. From there he would have been allocated to to Number 4 company, which was a Special Mortar Company equipped with 4 inch Stokes mortars, firing gas filled bombs, thermite and smoke ammunition. The Special Mortar companies formed the 5th Battalion of the Special Brigade. With regard to his death, this is a little more problematic. It was not unusual for brigade units to be attached to other companies for particular operations. I note from your post in the "Soldiers" section, that he had been attached to N Company at the time of his death. This unit was a cylinder company , dispensing gas from steel cylinders. much like the oxygen cylinders to be found with todays's oxy-acteylene welding kits. However, from 1917 onwards most SB units were also trained , and used, the Livens Projector, a crude but effective mortar type device that was fired remotely in batteries or multiples thereof, of 25. On 2 . 5 .17 there was a SB operation South of Roeux during which 198 Livens projectors were fired in support of a 12td Division operation. However, I note from a previous co-respondent that he is listed as having died rather than than killed in action. This would indicate that he may have been gassed, if family memory is correct of course, a day or two earlier. In this case it would be useful to consult the unit war diaries at the National Archives. 4 Company Diary can b be found in WO 95/333 and N Company diary in WO 95/402, which will give the day to day doings of the units..
With your kind help along with others I am piecing it all together. Although I visited the national archives the other day for the first time I have missed some valuable information . Those references you have given me we make it that much easier. I only got as far as his medal card which did not reveal many clues so I will return to follow up your clues. If you think of anything else I can pursue whilst I am there please let me know. Interests:Research on local war memorials and police officers from north eastern forces who served during the 1st WW. Corporal 113336 Edwin Ryhmer 'E' Special Coy, Royal Engineers died of wounds 8.10.1917 aged 22 years. Son of George & Mary Ann Rhymer of 'Fairfield', North Road, Spennymoor, Co Durham. Brothers Harold & Wilfred lived with their parents. On 8th October 1917 at the Armstrong College Hospital, Newcastle, Cpl Edwin Ryhmer 11336, 'E' Special Coy, Royal Engineers died from wounds received in action a fortnight earlier. He was buried in the family plot at York Hill Cemetery (Locals call it York Hill, correct one is above) on the 11th October and his grave is marked by a black steel cross (Grave C854). Before the war, Cpl Rhymer, aged 22 years, worked as an assistant analytical chemist at the Tudhoe Ironworks laboratory at the top of Dobbie's Bank. His parents, George (an accountant) and Mary Rhymer lived at 'Fairfield', North Road. George Rhymer was a member of Spennymoor Town Council and had laid the foundation stone for the new Town Hall. His name is commemorated on the Tudhoe Colliery Methodist Church memorial, and Spennymoor War Memorial where his initials have been rcorded as E W Rhymer. I do not know what the W stands for as in the 1911 census he is recorded as just Edwin and there is no army records for him on Ancestry. If you can assist me with any other information on him I will add it to my records. Many thanks for the information. He was an original Special Companies man who would have enlisted around August 1915 in response to the call for "men with experience in Chemistry" to enlist. The likelyhood is that he would have been given a train ticket to travel to the Whitehall recruiting office in London, where many of these men were sent to attest, and within a day or two sent to Chatham where they were kitted out, and if lucky, given some very rudimentary military training. From there he would have been dispatched to Helfaut in France, some four miles south of St Omer, where the Special Companies had set up their depot in the marie and the adjacent schoolhouse. The men were billeted in the surrounding villages. Technical training, such as it was was, was carried out there. He would have then been allocated to one of the following newly formed companies, 186-189 inclusive, which were to carry out the first British gas attack at the Loos battle in September 1915. The following year the Special companies were expanded into a Brigade sized formation and the companies were renamed alphabetically and placed into four battalions, a fifth later being added. Each of the numerically ordered units formed this basis for the new battalions, although there is no correlation for research purposes as far as personnel are concerned. E company was a cylinder company who, like most of the rest of the Brigade, were also trained in the use of the Livens Projector when it came into general use in 1917. The problem for the researcher is that the unit war diaries do not start until 1917, which makes it very difficult to trace the early footsteps of the originals. With regard to Edwin Rhymer, the following war diary may be useful in helping to trace his (short) career in 1917: WO 95/242	`E' Special Company Royal Engineers	1917 Mar. - 1919 June, which is available at the National Archives. The problem with tracing Cpl Rhymer is that he died of wounds, and his burial in the UK suggests that he was a casualty evacuation who died in a UK military hospital. In this respect, it may not be possible to find in the war diary when he received his ultimately fatal wound unless he is actually named, as it could have been received weeks or months before his death. Having died in the UK, it might be worth getting a copy of his death certificate to see what information that may reveal. His service record appears not to have survived, although I have only had a quick look. Apologies if you have already been this route, however I will keep a lookout and see if anything turns up in the future. Thanks for the information in regard to the duties he would have performed in the special brigade. I agree that I cannot see his name being mentioned in the war diaries with him dying of wounds at home. I have not as yet visited the cemetery which is local to me, if he has a CWGC headstone would you like a photograph to go with his history. I would appreciate a picture of his headstone, even if it is a civilian one. I will take the photograph when the weather improves and get back in touch. Hi Terry! I have a medal to 129193 Pnr. Herbert A. ANDERSON, who I believe was in 'F" Company of the Special Brigade. Would he by any chance show up in your research? His service papers don't exist, but men in his general number block were all in "F" Company (later numbers all begin to show "G" Company). I can't seem to find where he was from, but the man with the number before him, 129192 Pnr. Arthur Ernest Anderson, also an "F" Company man, might be a relative. Arthur was from Kensal Rise in London but I can't seem to find a family connection between the two men. Both Herbert, Arthur and a number of men in the same R.E. number block were all originally in the 12th Battalion of the Suffolk Regiment (at least from Suffollks nos. 20881 to 23163, there may be more) and later moved to the Special Brigade. The Long Long Trail indicates the 12th Batt. was a bantam battalion. Any idea why the mass movement of these men to the Special Brigade? "The new drafts came as pioneers, the second draft was a different sort of man - throw outs from the reserve line in England, but some good steady old workers. We were still not up to strength and the third draft consisted of men from the divisional artillery transport, now largely replaced by motor transport. The artillery apparently thought it a good opportunity to get rid of their riff-raff. A worst set of scallywags I have seldom met. Most of them were Scotch and my dislike of Scotchmen is probably due to these men." "Ramsey, a secondary school teacher - a most unpleasant fellow with a perpetual scowl and a terrible Birmingham accent" and of Pioneer Harrison "a white faced mothers darling who looked about 15 and certainly did not seem fit for the hardships of trench life." "As regards sergeants, our section was distinctly unlucky. The senior was Sgt Symons, a regular army man from the Lancers who had gone sick from Le Couture and we all hoped we should never see again. He was a drink sodden bully who claimed that he came from a good family. His most unpleasant trait was his habit of borrowing from corporals in his section and forgetting to pay back. Those who objected to being fleeced, myself particularly, had extra duties found for them. I should have been honestly pleased if he had been killed." Ginns goes on "Sgt Eger obtained his stripes as a dispenser in the RAMC. He was a weedy little man without any authority and of whom no one took any notice." Oh well, you can't please everybody. I'll have a look at the relevant war diaries and see what turns up. I have just come across this forum whilst trying to find out more about my Grandfather, Herbert Benjamin Littler, and have found it very interesting reading. He always told us that he was in the Special Brigade but I have been unable to verify this as his medal card shows him to have been in the Suffolk Regiment and then the RE as a Sapper. His number in the Suffolks was 23175 and this is just a few outside the range mentioned in Post 293, he was very short and in a Bantam Brigade. His RE number was 129225, I wonder if your records show this as being in the Special Brigade? He told us he was in action at Trones Wood and Bully Grenay, where he was wounded. Looks like your grandfather at least was in the 2nd Battalion of the Special Brigade (most likely Coy. H), previously of the 12th Suffolks. Many thanks for that info. My Grandfather was a bit of a storyteller so it is satisfying to have this story confirmed. The story he told us of how he got into the special brigade was interesting but again it would be interesting to here of anyone with similar experiences. He told us that he was stationed in Englane and getting bored when a request came in for volunteers for hazardous duty. He put his name forward and the entrance exam seem to consist of being asked the chemical formula for water. Once pass this hurdle he was sent somewhere in the midlands where they were given big, heavy cylinders and told to run up and down a field. After a while those still standing found themselves in the Special Brigade. A little late MAtt, but I have digital copies of the 'F' company special brigade war diary. Will be happy to share them with you if needed. I am researching my Great Uncle and any information you have about the duties and locations of the 2nd Special Bn. Royal Enginners during WW1 would be appreciated, particularly around the time of my Great Uncles death. My understanding is that he was a gas operator. Incidentally his brother, my Grandfather, Stephen Henry Straw, also served alongside William and, although twice wounded, survived the war. I am pretty new to this, but have a keen interest in miliatary history so any hints would be great. I completely missed your post, Steve. I'd love to have copies of the diary, if you still have them!